It’s been a stressful week for Zen and his entourage. Last Thursday Zen had continuing symptoms of pain as well as gastrointestinal distress. By Saturday, he seemed better, but I had an appointment, so I took him back to the vet anyway. (Zen managed to bite me on the nose, drawing blood, as I was putting him into the carrier, further sign that he was not happy with this plan.) We all sort of agreed that the fact I had hidden his pain meds in some cheddar cheese caused the tummy troubles, as birds are not good at digesting dairy products. But since we were there, Dr. Costanzo kept him for X-rays. That turned out to be a very good thing–and another reminder that erring on the side of taking an animal to the vet is always the right choice, even if you get some vet side-eye for being over anxious. The good news is that Zen does not have any leg damage, arthritis, or any other muscle or joint cause of pain. The not-so-good news is that he has metal in his GI tract. I saw the X-ray and it look like someone had sprinkled sand or rock salt through his digestive system. This is very weird. 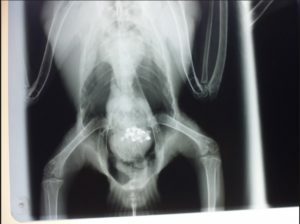 Usually when birds have metal inside them, it shows up as a lump because they swallowed something or got shot. We sent a blood sample off to the lab to test for lead and zinc. Begin head-scratching. 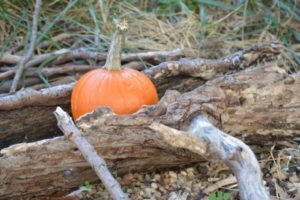 I went over Zen’s new garage enclosure with a fine-tooth comb. No damage to any nails, fasteners, or wiring. I couldn’t find a single peck mark. Could a mouse have nibbled on some cage wiring, had it in its gut, and then been fed to Zen? The mice come either from a company that produces feeders or a lab, so that seemed very unlikely. Aside from mice, Zen receives only the following food: chicken wing tips, dog food, eggs, chicken heart, and peanuts. All of that should be harmless. But I have noticed that Zen eats chicken bones (Gwen and Stephen do not), and we are living in a world of industrial farming, so I checked. Yup. Chicken bones contain metals, including lead and zinc. I found a bunch of articles from the paleo-organic-gut-health crowd fighting about whether the broth craze (I wasn’t aware there was one) is healthy or not because metals leach out of the bones during the rendering process. (The NIH confirms this happens, so if any of you are trying to reach the pinnacle of heath by living on a diet of chicken broth, give it up.) I’m not expert, but if metal leaches out of the bones, then it has to be there in the first place (maybe even at high concentrations), so Zen chowing down on the crunchy goodness of a nice wing bone over time could plausibly cause problems. The chicken bone theory was awesome — until the blood test for lead and zinc came back negative (not that I’m complaining). So we were puttering along with psyllium (aka metamucil) to clean out his gut and gabapentin for the pain until Tuesday morning, when I found blood drops under the perch. Zing, swish, zowie and we were back at the vet’s. Luckily, Dr. Costanzo said this could be attributed to passing metal bits (ouch), but we added a second medicine to help ease cleaning everything out. Operation Magnet continues in the dark as we work to get the metal out of Zen’s gut, but I’m taking all the precautions I can think of. I’ve removed chicken bones from Zen’s diet and am covering up a corner of his enclosure with exposed particle board. Dr. Costanzo mentioned adding pureed pumpkin to his diet, which is hilarious. 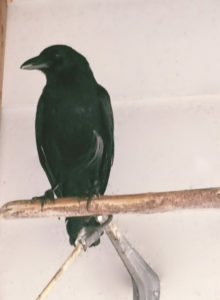 Crows are uniform in their conclusion that consuming anything orange (with the possible exception of a Cheeto) is an affront to everything that is sacred and holy. There are certain places one simply does not go.